Check the brake pedal height (H1) between the dash lower panel (1) and the brake pedal upper surface. Check the brake pedal height with the floor trim removed. Check the clearance (A) between the switch assembly bracket (3), the stop lamp switch (2) and the brake pedal position switch (if equipped) (1). 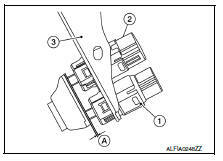 Pull the brake pedal pad to check that both the stop lamp switch (2) and brake pedal position switch (1) contact ends to brake pedal bracket (3) clearance (A) are within specification. Check that brake pedal play does not exist. Check the brake pedal height (H2) between the dash lower panel (1) and the brake pedal upper surface when depressing the brake pedal at 490 N (50 kg, 110 lb) while turning engine ON. Depressed brake pedal height (H2) : Refer to BR-54, "Brake Pedal". Check the depressed brake pedal height with the floor trim removed.